Over the years, I’ve mostly enjoyed the light popcorn flicks created by director Roland Emmerich, but I must admit his movies often don’t wear well. 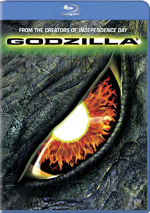 For films such as 1996’s Independence Day and 1998’s Godzilla, my first screening was my favorite. His works don’t hold up to much scrutiny, which makes them somewhat tough to take upon subsequent inspection. To be sure, I still think those two remain reasonably enjoyable, but too many of the flaws come through with each new viewing. 1992’s Universal Soldier and 2000’s The Patriot escaped this pattern just because I didn’t like them very much from the start. However, 1994’s Stargate, introduced the repeated viewings “curse”. While I really liked the flick when I first saw it theatrically, it seemed much more flawed to me the second time. I thought part of that might have resulted from the timing; as I recall, the second screening took plus only a few months after the first. Unfortunately, it appears that timing had nothing to do with it. I’ve only seen the flick sporadically over the years so I’m open to reappraisals of it. Now that I’ve given it another look on Blu-ray, I can relate that my feelings haven’t changed. Though not without its charms, Stargate comes across as a muddled and generally unsatisfying sci-fi action movie. While the Blu-ray includes both theatrical and “director’s” cuts of Stargate, my review will relate to the latter. The longer version starts with a prologue in 8000 BC. An alien craft lands in the North African desert and captures some androgynous local (Jaye Davidson). Immediately we flash forward to Egypt in 1928, where we see an archeologist named Dr. Langford (Erik Holland) who leads an expedition that discovers a mysterious artifact we’ll later come to know as a stargate. After that episode, we wind up in the present day – 1994, actually – where we see Langford’s now-elderly daughter Catherine (Viveca Lindfors) as she attends a lecture by controversial linguist Dr. Daniel Jackson (James Spader). The other academics belittle his theories, but he clearly knows his stuff, so via Catherine, the military recruits him to help decipher the hieroglyphs on the stargate. In the meantime, we meet Colonel Jack O’Neil (Kurt Russell). Depressed and suicidal after the accidental shooting death of his son, General West (Leon Rippy) reactivates O’Neil to take on the stargate assignment. With Jackson’s work, they find out how to use the stargate to travel across the galaxy. The military wants to send a reconnaissance mission with O’Neil at the helm, but they need someone to translate additional symbols when they arrive at their destination so they can return home. As such, Jackson goes along for the ride. Unfortunately, Jackson assumed that certain images would readily appear at the other side, so when they don’t, the team gets stranded on the alien planet. They’ll remain there until Jackson can find what he needs. Eventually the group stumbles upon an alien society that strongly resembles that of ancient Egypt. They get to know the locals and Jackson attempts to grasp the connections between this world and the old Earth societies. As a gift, the villagers offer him a babe named Sha’uri (Mili Avatal) who he gets to help him learn the hieroglyphic system. In the meantime back at the stargate, some mysterious force attacks the soldiers. Eventually we find out that Ra (Davidson) awoke and attacked the men. This leads to our discovery of the story behind the stargate and the people of this planet, and eventually they’ll need to examine their world’s underpinnings and confront their masters. In addition, the soldiers all still want to get home, and they need to figure out how to do so. A throwback to another era, Stargate uses the action/adventure flicks of the Thirties and Forties as its inspiration. It conveys that tone fairly well, but unfortunately, it steals from so many sources that it often comes across as ridiculously derivative. 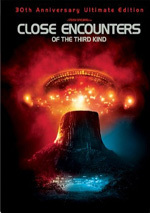 As I watched Stargate, I saw obvious evocations of Alien, Aliens, Close Encounters of the Third Kind, and Star Wars. Plenty more exist, but those stood out to me. At times Stargate feels more like a game of “spot the reference” than an actual movie. Admittedly, Stargate sometimes offers an interesting combination of genres. It melds monsters, science fiction, horror and exploration all in one package. Unfortunately, it rarely does so in a very satisfying manner. It seems cobbled together in a haphazard way, and that allows for some occasional moments of excitement but it makes the piece as a whole appear jumbled. Ultimately, Stargate seems too derivative and lifeless to work. Some interesting moments occur, but too much of the flick comes across as erratic and silly to succeed. It can be fun for a single viewing, but with additional screenings, Stargate loses most of its luster. Stargate appears in an aspect ratio of approximately 2.40:1 on this Blu-ray Disc. While generally positive, the transfer wasn’t as consistent as I’d like. Sharpness appeared good most of the time, though some parts of the film gave off a flat, muted look. This meant a lack of expected detail in more than a few shots. They rarely became genuinely soft or fuzzy, but they failed to deliver the level of accuracy that they should. No issues with jagged edges or shimmering occurred, and edge enhancement appeared to be absent. Source flaws also occurred infrequently. I noticed a minor blotch here and a tiny speck there, but that was about it. I did think parts of the flick looked unusually grainy given the movie’s vintage and photographic style. Colors appeared positive. Stargate presented a fairly golden hue that matched its desert setting, and the tones came across as vivid and distinct. Black levels looked deep and solid, and shadows detail was good. Again, the minor haziness caused a little lack of definition, but not to a significant degree. The handful of issues kept this one at “B-” level. I felt much more pleased with the DTS-HD MA 7.1 audio of Stargate. The soundfield appeared quite active and involving. From the front channels, we received a good sense of setting and atmosphere. Music demonstrated nice stereo imaging, while effects seemed clearly delineated and appropriately placed. These elements meshed together well and showed smooth movement across the channels. As for the surrounds, they added a great deal of information to the package. The rear speakers contributed a lot of ambient material and kicked to life well during many action sequences. The trip through the stargate sounded fantastic, and the arrival of Ra also presented fine use of the discrete rear channels. Audio quality also seemed good. Speech always remained intelligible and clear; the lines lacked edginess or notable concerns. Music came across as full and lively. Effects were accurate and distinct, and they packed a serious punch. Bass response came across as deep and tight. Overall, the soundtrack of Stargate was consistently terrific. In terms of extras, this “15th Anniversary Edition” of Stargate mixes old and new components. I’ll mark Blu-ray exclusives with special blue print. The disc includes both the film’s theatrical cut along with an unrated director’s cut. The former runs two hours, 47 seconds, while the latter goes for two hours, nine minutes and 36 seconds. That’s a moderately substantial amount of extra footage, but I don’t think it notably alters the film. Both provide virtually the same impact and impression. 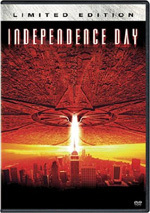 Along with the extended cut, we find an audio commentary from director Roland Emmerich and producer Dean Devlin. Both sit together for this running, screen-specific track. This marked the third commentary I heard from Devlin and Emmerich. Their remarks for Independence Day earned them the animosity of many fans, since they provided a rather dull piece of work. Actually, I thought it was a decent track, but it suffered from too many gaps and a generally unenthusiastic tone. Their commentary for The Patriot was worse. The pair proved chattier there, but that caused problems, especially since Emmerich came across as borderline incoherent much of the time. Devlin offered some good material, but Emmerich’s vocal tics made the piece almost unlistenable. Emmerich’s language issues cause some concerns during Stargate as well; he often interjects “you know”, “like” and “kind of” into his statements, and this makes his remarks sound confusing. Nonetheless, he appears better composed here than on The Patriot, and he actually manages to offer some decent information during Stargate. The pair interact well and give us a fair amount of useful facts. They cover topics such as sets, locations, working with the actors, effects, and story. Devlin also tries to make sure that we know what parts are new to the director’s cut. However, Emmerich remains moderately incoherent at times, and too many gaps mar this piece. In addition, the track falters after the first act or so; the pair become less compelling as the film progresses. Devlin spends far too much time simply relating plot points, especially during the movie’s final act. While arguably the best commentary provided by Emmerich and Devlin, it remains fairly mediocre. Next we find a featurette entitled Is There a Stargate? This 12-minute and 10-second program concentrates on the work of Erich Von Daniken, author of Chariots of the Gods. We learn of the roots of his interest in potential ancient alien visitations as well as discussions of his theories. Interviews from Von Daniken and Legendary Times editor Giorgio Tsoukalos appear. Frankly, it all sounds like a crock to me, but the program offers a moderately interesting synopsis of these ideas. It never addresses the subject of the title, though, as it doesn’t talk about the possible existence of an actual stargate. The Making of Stargate: Creating a Whole New World goes for 23-minutes and 31-seconds. We hear from special creature effects designer Patrick Tatopoulos, conceptual designer Oliver Scholl, production designer Holger Gross, visual effects supervisor Jeff Okun, location manager Ken Fix, and actors Kurt Russell and James Spader. If you’ve already listened to the audio commentary, you’ll know much of the material presented here. Many of the same facts pop up again, though a fair number of new details emerge, and the behind the scenes shots seem fun. Tatopoulos leads us through demonstrations of some practical effects, and other images offer nice insight into the work. Unfortunately, “World” suffers from a rather fluffy tone. For example, the narrator tells us the movie came out “at a time when special effects were still new”. No – the original King Kong came out at a time when special effects were still new, and this statement seems bizarre. In addition, the piece includes way too many movie clips. Some of these help illustrate information – such as the Spader puppet pulled by the dog-powered mastidge – but many appear gratuitous. “World” includes some decent information, but it could have been just as satisfying at a much shorter length. Three components show up under Stargate: History Made (22:30). We find “Deciphering the Gate: Concepts and Casting” (7:50), “Opening the Gate: The Making of Stargate” (10:11) and “Passing Through the Gate: The Legacy” (4:29). During “Made”, we hear from Devlin, Emmerich, Tatopoulos, Egyptology consultant Stuart Tyson Smith, fans Craig Owen, Frank Gerney and Eric Hindes, and actors Erick Avanti and Mili Avital. The shows look at the film’s origins and development, cast and performances, locations and effects, visual and set design, the use of the Egyptian language, and the movie’s success/legacy. All of the comments come from modern interviews, which is good and bad. The negative comes from the absence of so many participants; in particular, it’s too bad Spader and Russell fail to appear. Nonetheless, I’m glad we have retrospective comments and we’re not just stuck with info from 1994. I especially like Avanti’s remarks about dealing with language challenges, “History Made” is a little scattershot, but it has some good info. A new “picture in picture” feature accompanies the Extended Cut. Stargate Ultimate Knowledge provides info from Emmerich, Spader, Russell, Devlin, Avital, Von Daniken, Tsoukalos, Gross, Okun, Scholl, actor Alexis Cruz and a few unnamed crewmembers. (Actually, the program names no one, but I recognized the ones I mentioned because they appeared elsewhere on this disc.) We get notes about cast, characters and performances, storyboarding, historical elements, set design and creation, various effects, location challenges, costumes and a few other areas. When done well, these running “Picture in Picture” features can add a lot to our appreciation of a film’s creation; they act like visual commentaries, so they can bring a lot to the table. When they’re not particularly well-executed, though, they can be tiresome and tedious; as is the case with audio commentaries, it’s a chore to sit through a whole movie for sporadic nuggets of information. The Stargate PiP feature falls somewhere between those two poles. It has enough going for it to make it acceptably useful, but it’s nowhere near as good as the best programs of this sort. We only find 25 short segments spread across 129 minutes of movie, so the PiP doesn’t fill time on a consistent basis. In addition, the material itself is only moderately compelling. We get some decent soundbites and shots from the set, but I don’t think we learn much that doesn’t appear elsewhere. Stargate diehards will probably enjoy it, but I doubt it’ll do much for more casual fans. For a new game, we get Master of the Stargate: Interactive Trivia Challenge. You can play short or long versions of the game. “Master” played along with the movie, although the flick appeared in a small box, so it wasn’t very watchable. Also, the game’s interface seemed pretty clunky. I like to try out all the extras on the discs I review, but “Master” is so user-unfriendly that I bailed pretty quickly. It’s too slow and frustrating to be fun. A Gag Reel runs three minutes, 15 seconds. Rather than offer the usual collection of goofs and giggles, this one offers a little piece of silliness shot on the set. It pokes fun at the various participants and the production, as it provides a continuous camera move through the location. It’s probably funnier for those who were here, but it’s an interesting and unusual addition to the package. The disc opens with some ads. We get promos for Planet Hulk, Hulk Vs. Wolverine, Battle for Terra, Hulk Vs. Thor, The Spirit and The Forbidden Kingdom. These show up under Also from Lions Gate as well; the disc also includes the trailer for Stargate. While I wouldn’t call Stargate a bad movie, it’s not one that holds up well over time. The flick has some fun moments but it suffers from erratic pacing and too many influences worn on its sleeve. The Blu-ray gives us erratic picture and excellent audio along with erratic but decent extras. 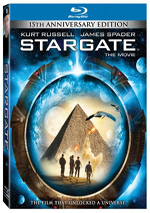 This is the best version of Stargate to emerge on home video, but it’s not the slam dunk I’d like.